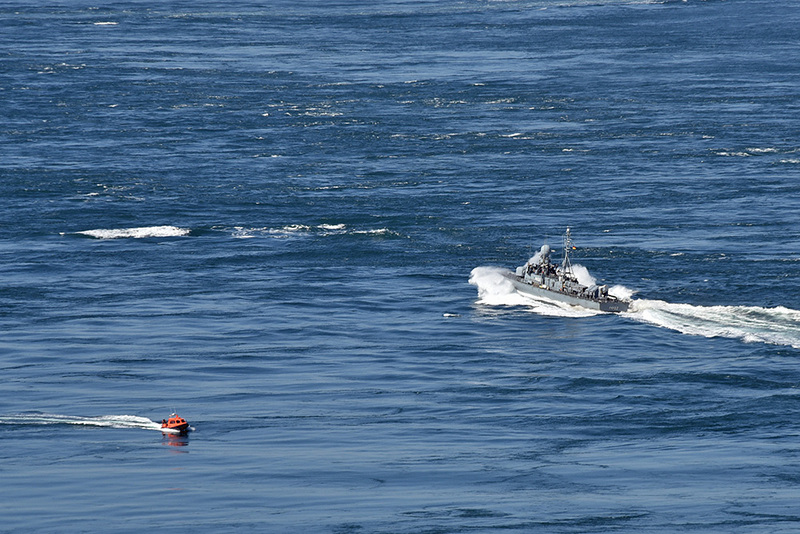 Two visitors to the Corryvreckan whirlpool, spotted from the far northern end of Jura in April 2015. On the right the German Schnellboot (fast attack craft) P6122 ‘Puma’, the third of three boats of this class passing through that afternoon. On the left the much smaller RIB from Venture West visiting the Corryvreckan from Crinan. This entry was posted in Jura Excursion, Landscape, New Post, Sunny Weather and tagged Corryvreckan Whirlpool, Gulf of Corryvreckan, Jura by Armin Grewe. Bookmark the permalink.